There’s no doubt that the discovery of antibiotics was a good thing. Antibiotics and other similar drugs have been used for the last 70 years to treat patients who have infectious diseases. “Since the 1940s, these drugs have greatly reduced illness and death from infectious diseases,” according to the Centers for Disease Control and Prevention (CDC). But our long-term use (and often times overuse) of antibiotics has caused many harmful pathogens to become resistant to these medications. Take a look at this long list from the CDC, which shows the top 18 drug resistant threats to the United States. “The rapid emergence of resistant bacteria is occurring worldwide, endangering the efficacy of antibiotics, which have transformed medicine and saved millions of lives,” reports the National Institutes of Health (NIH). The CDC also reports that each year in the United States, at least 2 million people become infected with bacteria that are resistant to antibiotics and at least 23,000 people die each year as a direct result of these infections. So clearly, we need other ways to manage infections besides antibiotics. Perhaps, instead of aggressively attacking the bacteria with antibiotics, the number one focus should be making ourselves healthier so we can more effectively fight diseases. And one way to be healthier is to be nutritionally balanced which includes having just the right amount of minerals, like iron, in our bodies. And credible research is supporting this approach. According to Professor Ayres, increasing evidence shows that we all have a cooperative defense system, which promotes health during host-microbe interactions. To make this all easier to understand, think about this scenario. You are dating that bad girl or bad boy you know you shouldn’t be dating. The “bacteria” (the bad boy or girl) has already entered your world, but your “cooperative defense system” (your way of mentally and emotionally coping) will determine whether you come out of this situation heartbroken or not. Got it? Now, back to bacteria. In 2017, Ayres and her team “discovered that Salmonella bacteria can overcome a host's natural aversion to food when sick, which results in more nutrients for the bacteria and a gentler infection for the host." 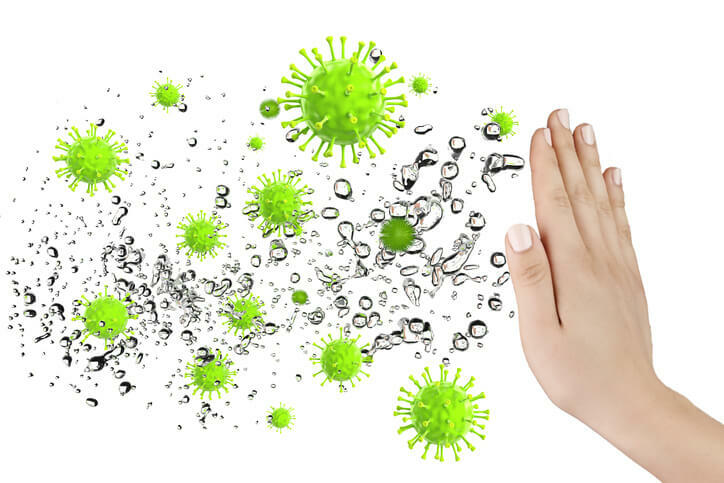 So this all suggests that our bodies may be able to naturally handle the invasion of harmful bacteria, and some strains may even be somewhat beneficial. And researchers recently discovered that when mice were given iron supplements, they were able to survive a normally lethal bacterial infection. On top of this, there was evidence that later generations of these dangerous bacteria become less virulent. Ayres and her team looked at a gastrointestinal infection in mice caused by a bacteria related to the strain of E. coli you often hear about when there is a food recall. To test the idea of a cooperative defense system, the researchers used an approach called lethal dose 50 (LD50). This dose of the bacteria killed 50 percent of the host population, while the other half of the hosts survived. They compared gene activity in the infected healthy mice versus the infected sick mice. There was also a group of uninfected healthy mice (the control group). Researchers observed that host iron metabolism was increased in the infected healthy population. Then, the researchers tested the importance of iron metabolism in helping the cooperative defense system work. The team administered an LD100 (which would normally kill 100 percent of the host population) of the bacteria to a population of mice. They fed half of this infected population a normal diet and the other half an iron-supplemented diet. The iron group only followed this diet for 14 days and then returned to a normal diet. At day 20, the non-iron group of mice died from the infection. 100 percent of the iron group, however, survived and were healthy (even at day 30). On top of this, the researchers discovered that if they gave mice 1000 times the LD100 of the bacteria, taking iron for just two weeks kept them alive and healthy. “Ayres and her team used dietary iron as a tool to investigate the mechanism by which iron metabolism cured the infection,” the report says. Furthermore, a year later the team found that the infected mice who received the iron still had the bacteria in their gastrointestinal tract (but were still alive and healthy). "This was so exciting to us because it suggested that we basically drove the evolution of weakened strains of the pathogen," Ayres said. More research is needed, and it is important to know that iron supplementation may not work for managing all types of infectious disease. With some diseases, like malaria, iron may actually feed the infection. But this research shows that, once again, being nutritionally balanced may increase our chances of staying healthy and fighting many infections. And being nutritionally balanced includes having the right amount of the six basic nutrients our bodies need to be healthy. They are water, protein, carbohydrates, fats, vitamins and minerals, like iron, which we discussed above.